Another week gone, and GOOD MORNING – it’s again Wednesday… ‘desk day’. My desk didn’t see much activity last week… I was mostly working on the computer. I also visited a fellow artist that I met in a gallery last year. She lives in my town and we made an appointment to get to know each other a bit more and talk about a ‘project’ we might work on together (still in the ‘brainstorm phase’ so I cannot tell you more.) 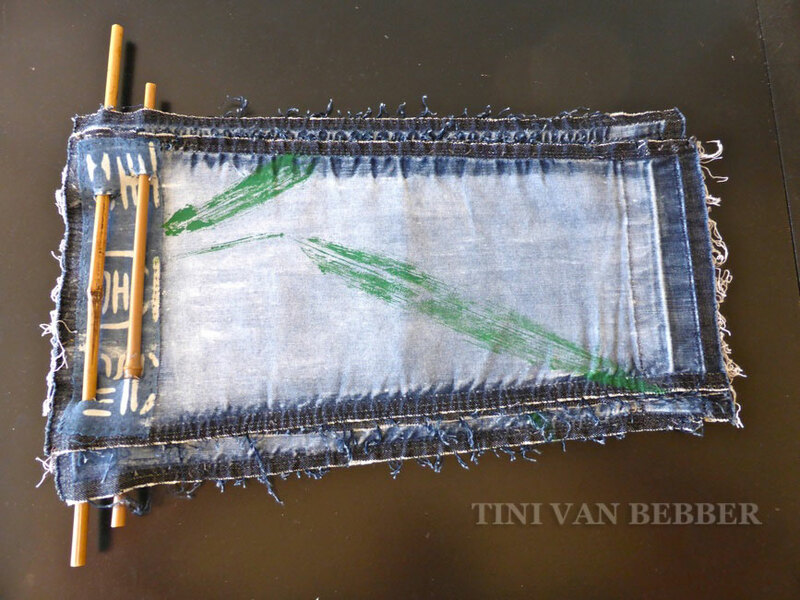 Her name is Tini van Bebber and she’s into ‘textile and words’. I love how we have things in common and yet create in a totally different way. Doing all kind of different things last week you might think my desk is empty than… well, no. I layed my Chronicles art journal on the desk and whenever I have a spare minute, I add something to the pages. 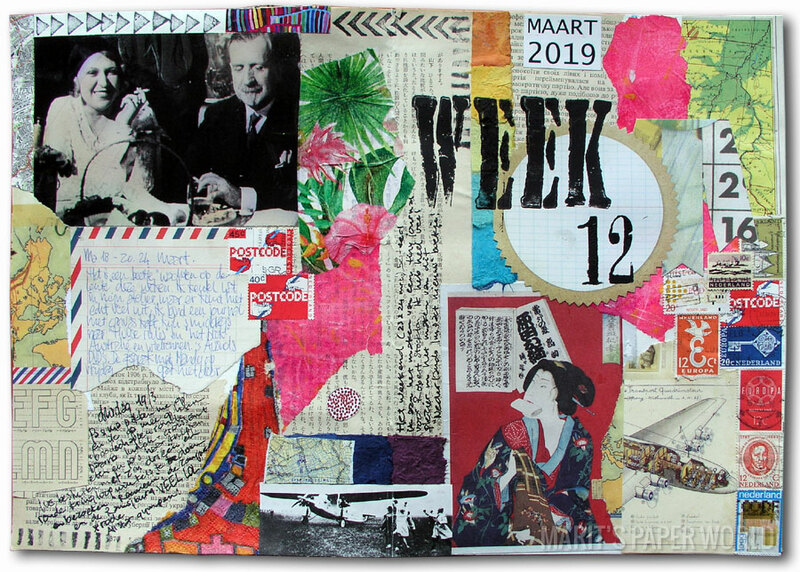 Most weeks, the Chronicles spread comes together in one or two atelier-sessions but not this time… it will probably turn out to be a chaotic spread – we’ll see. And here’s the spread that was on my desk last week. I just added some journaling to the page and called it finished. It’s another grey and windy day on my peninsula… it’s nowhere near Spring outside so I put a little flower pot (Narcissus ‘Tête-a-Tête’) on the table to bring Spring into the house. My beloved bought me a present last week: “Journal d’Irlande” – the latest book, published posthumously, by my favourite writer Benoîte Groult and I plan to spend some time curled up in the chair reading. It’s just a day for that! Hope your day will be nice and cozy too, enjoy! Have a lovely curled up kind of day. What a lovely way to spend your time when the weather outside is not being kind. It is cold here in the UK too. Have been on a journey in your new-found friends blog. What wonderful work she does which appeals to me as it is a lot like journalling although it is textiles and not paper. I just wish I had the talent to do things like that as well as what I do. Love your desk and your chronicle. Enjoy your day and your week. I hope you enjoy your cosy curled up day. It’s really cold here today so I’ve just turned the heating up so my hands are warm enough to create…the play mat is coming along well…so far I’ve ‘planted’ 6 rows of carrots, 4 cabbages and a row of lettuce on it and have just attached some ‘bales of straw to it. can you tell I’m having fun? Hi Marit ! 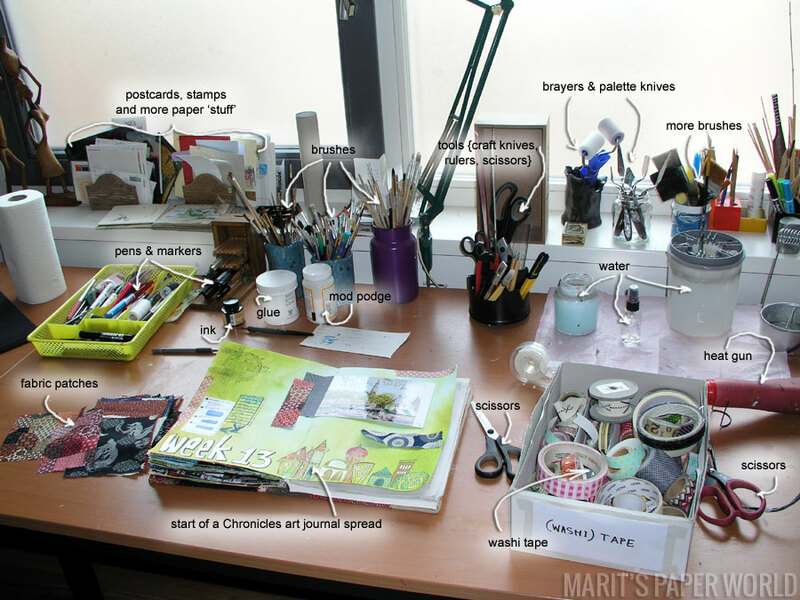 Your desk is certainly as busy and orderly as ever. I like that piece by Tini very much. The start of an intriguing friendship. I really like your Week 12 very much. Ah the dreaded computer work. Me too. And I like the way your chronicle page turned out..perhaps visiting it a little every day and now then is an even better reflection of your day and week? I bet it felt strange though….probably not quite as satisfying in the feeling of getting things done! Thrilled that you’re brainstorming with another artist, I shall be browsingher Projecten very soon! Wow, I love RTini’s work, she has an admirer here too!! So clever what she (and you!) achieves with fabric. Autumn is arriving here but we are still nice and sunny and warm today, I sit in the lounge room in my chair to enjoy the sunshine when I can and with a dud leg and hand I’ve more of an excuse than usual! Love your journal so bright and cheery and think your atelier is grand too!